“Madeline’s Madeline” looks like an experimental movie only because it’s told through the eyes of an experimental human being: a teenage girl struggling with mental illness while flowering angrily, impetuously, and vibrantly into herself. 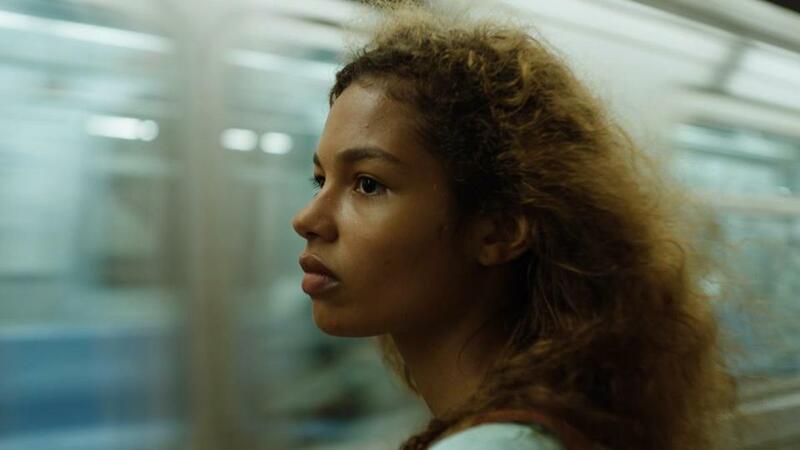 The film, written and directed by Josephine Decker and starring a remarkable newcomer named Helena Howard, is a stunner — one of the best films of the year, if also one of the hardest to initially get your head around. The early scenes seem willfully impenetrable, with the cinematography refusing to settle on a focal plane and the sound mix dripping with random clinks and whispers. Upping the anxiety quotient, the tightly interlocked a cappella harmonies of the vocal group Roomful of Teeth swerve in and out of the soundtrack like a chorus of cicadas. This is cinema as vertigo, not so much directed as choreographed and collaged. It’s also an accurate approximation of how the world appears to 16-year-old Madeline (Howard). The girl lives in working class/boho New York City with her mother, Regina (performance artist Miranda July), who’s at the end of her tether when the movie opens. The screenplay, co-written by Donna Di Novelli, smuggles in hints of psychiatric hospitalizations in the past and medications running low in the present. The neighbor boys think Madeline is some kind of freak: the girl with the supernova hair who says weird things and who toggles between gentleness and rage. Her other issues aside, Madeline is as rebellious as her age demands, burning with a life force and a sexuality she has no idea how to channel. The intuitive genius of Howard’s performance is that it’s up to the older women — and us — to separate the strands of normal adolescent pushback from the ones that flash danger. And because Decker keeps us tied to the mast of Madeline’s senses and sensibilities, it’s easy to feel the mother is clinging too tightly or to miss how avidly the teacher gloms onto the girl’s illness as fodder for a new performance piece. Where’s the line between art and exploitation? Decker cheats a bit by giving us glimpses of the troupe’s increasingly appalled dancers and backstage personnel; as it takes climactic shape, “Madeline’s Madeline” becomes very nearly a comedy about a lost girl finding her community while performing a sort of necessary matricide. Those final 20 minutes are among the most electrifying filmmaking I’ve seen this year, as the stylistic sound and fury of Decker’s approach — the chaos of Madeline’s perceptions — suddenly finds shape and purpose and rhythm. The theatrical uprising swallows up the heroine in a groove of ecstasy and acceptance, and the pulse of energy, of pure adrenaline joy, lifts all boats, including ours. It’s a cinematic and dramatic high, in other words, and it’s the nature of highs that they often prove illusory. You may be thinking about the film’s final shot for days; you may never be able to tell if and where reality shades into fantasy, or how many of those teeming harmonies Madeline hears come from outside her own head. In a way I’ve never before seen done onscreen, “Madeline’s Madeline” fuses triumph and tragedy until the two feel strong and indistinguishable. Directed by Josephine Decker. Written by Decker and Donna Di Novelli. Starring Helena Howard, Miranda July, Molly Parker. At Brattle. 93 minutes. Unrated (as PG-13: Some language and disturbing images).